Please note this product has been discontinued but we have fist mics ,12v dc leads and ajustable brackets in stock. The Swiftech M-168 is a fully featured VHF radio telephone that has all the facilities of a top end 'professional' unit at an affordable price. Ruggedly built with a die cast aluminium chassis, the M-168 is both compact and weather resistant (featuring full 0-ring seals). 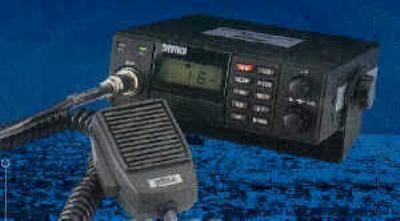 The M-168 is a synthesised, fixed mount VHF marine transceiver, operating on the 156.025-163.275 MHz frequency range. The M-168 operates on all currently allocated marine channels plus up to 10 expansion channels (for private use). Both channels Ml and M2 are fitted. The M-168 radio features very fast scanning (10 channels per second) with the facility to prioritise channel 16. This allows effective scanning of programmed channels ensuring that important messages/calls are never missed. · All International and US channels. · Large easy to read backlit LCD read-out. · 10 programmable memory channels (for private channel installation). · Channel 16 priority access. · Programmable scan facility (allows user to select channels to be scanned). · Priority scan giving an effective multi channel watch system whilst reverting to channel 16 on a priority basis. In stock a replacement mic for the M168 vhf.